As disseminated intravascular coagulation (DIC) causes multiple organ failure, recombinant thrombomodulin (rTM) is widely used in Japan for treating DIC. However, the optimal timing of rTM administration has not yet been determined. We hypothesized that the administration of rTM before progression of disease causing DIC might be better for the treatment of DIC than that after progression of disease. A total of 101 patients received rTM in the intensive care unit (ICU) between August 2008 and November 2013 were enrolled. Depending on survival at hospital discharge, the patients were divided into survivor (group S) and non-survivor groups (group NS). Patient characteristics before DIC development, acute physiology and chronic health evaluation II (APACHEII) score and sequential organ failure assessment (SOFA) score at the start of rTM administration, rTM administration dose, duration of time between the onset of disease causing DIC and rTM administration, and combination therapy were collected. Group S had 57 patients, and group NS had 44 patients. More than 70% of patients in group S were administrated rTM within 1 day from the onset of disease causing DIC (0 days, 40% vs 20%; 1 day, 33% vs 30%; more than 2 days, 26% vs 50%). At the start of the rTM administration, the APACHEII and SOFA scores were significantly lower in group S (26 ± 6 vs 32 ± 6, p < 0. 001; 9.5 ± 4.2 vs 13.4 ± 3.6, p < 0.001). Multivariate logistic regression analysis of outcomes was performed. The duration of time between the onset of disease causing DIC and rTM administration, the APACHEII score, the SOFA score, and use of continuous renal replacement therapy (CRRT) were selected as candidate variables (p < 0.05). The SOFA scores and use of CRRT were highly correlated with the APACHEII score (Pearson correlation = 0.63 and 0.43, respectively). Therefore, the SOFA score and the use of CRRT were excluded from this model. Late administration of rTM (more than 2 days between the onset of disease and rTM administration) was associated with undesirable outcome (odds ratio = 3.36, 95% confidence interval = 1.03–10.92, p = 0.044). This study suggested that the administration of rTM before the progression of disease causing DIC might be better than that after progression of disease causing DIC. Further randomized clinical trials are required to elucidate whether early administration of rTM is actually effective. Disseminated intravascular coagulation (DIC) occurs in 9%–19% of patients in the intensive care unit (ICU), and rate of mortality associated with DIC is as high as 45%–78% . The development of new therapies to treat DIC is expected because this rate has not changed in the last 10 years . In Japan, recombinant human soluble thrombomodulin-alpha (rTM) (Recomodulin, Asahi Kasei Pharma, Tokyo, Japan) has been available as a therapeutic DIC drug since 2008. This drug binds to thrombin to inactivate coagulation . In addition, rTM promotes protein C activation by thrombin, resulting in the formation of activated protein C (APC) . APC in turn inhibits thrombin generation by inactivating coagulation factors Va and VIIIa to inhibit the activation of the blood coagulation system . In our ICU, rTM has been used as the first-line drug for the treatment of DIC because it is more effective than heparin and has fewer bleeding-related side effects . Recently, the safe use of rTM for ICU patients has been reported in a phase IIb study of rTM . Another study had shown that rTM may be superior to conventional DIC treatments in patients in the ICU . However, the optimal timing of rTM administration has not yet been determined. We hypothesized that the administration of rTM before the progression of disease causing DIC might be better for the treatment of DIC than that after progression of disease causing DIC. Therefore, we investigated whether the timing of rTM administration was associated with differences between survivors and non-survivors in a retrospective analysis. This study was approved by the ethics committee of Kochi Medical School, and the need to obtain informed consent was waived because this study was a retrospective analysis. In our hospital, every patient was able to declare refusing use of data from the present to the future in writing. Therefore, patients who refused the use of their record were excluded from the study. The subjects included a consecutive series of patients with DIC who were treated with rTM in our ICU between August 2008 and November 2013. Of these patients, those <18 years of age and those who refused the use of their record at hospitalization were excluded from the study. Depending on survival at hospital discharge, the patients were divided into survivor (group S) and non-survivor groups (group NS). The diagnosis of DIC was based on the DIC criteria of the Japanese Association for Acute Medicine . These diagnostic criteria consist of four items, namely, more than three items of the diagnostic criteria of systemic inflammatory response syndrome are satisfied, the platelet count, the prothrombin time ratio, and the concentration of fibrin/fibrinogen degradation products (Figure 1). Patients with a total score of ≥4 were diagnosed as having DIC. 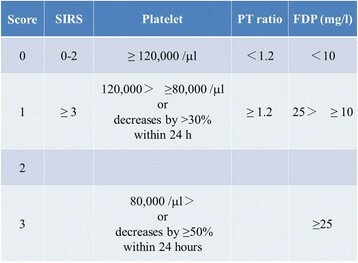 Disseminated Intravascular Coagulation scoring system. Disseminated Intravascular Coagulation scoring system was shown. SIRS items of the diagnostic criteria of systemic inflammatory response syndrome are satisfied, PT ratio prothrombin time ratio, FDP concentration of fibrin/fibrinogen degradation products. We defined the onset of disease causing DIC as the timing when individual physicians diagnosed it and wrote medical records. According to the drug information, the doses of rTM are defined as 380 and 130 U/kg/day for patients with non-impaired renal function and those with impaired renal function, respectively. However, the drug information does not define impaired renal function and recommends decrease to 130 U/kg/day if bleeding occurs in patients with impaired renal function. Therefore, individual physicians decided the doses of rTM in accordance with this recommendation and patient status. In addition, sepsis was treated in accordance with the Surviving Sepsis Campaign Guidelines ,, but the details were decided by individual physicians. The following data were obtained from electronic patient records: patient characteristics before DIC development, acute physiology and chronic health evaluation II (APACHEII) score and sequential organ failure assessment (SOFA) score at the start of rTM administration, rTM administration dose and duration, duration of time between the onset of disease causing DIC and rTM administration, and combination therapy. Data are expressed as the mean ± standard deviation. Associations between the outcome and baseline variables were examined by univariate analysis. For the analysis of continuous variables, a t test was used, and a chi-square test was used to analyze categorical variables. Variables were considered potentially associated with outcome when p < 0.05; these variables were further evaluated using a multivariate logistic regression model. The age was included in components of the APACHEII score. Therefore, it was excluded from this model. When the linearity assumptions considered were violated, continuous variables were divided into tertiles and analyzed as discrete variables. For all analyses, a two-sided p value <0.05 was considered statistically significant. Favorableness of fit was evaluated using the Hosmer-Lemeshow test, and predictive ability was confirmed by c-statistics based on receiver operating characteristic analysis. Statistical analysis was performed using SAS version 9.3 (SAS Institute, Inc., Cary, NC, USA). A total of 105 patients received rTM in the ICU. Of these patients, 101 were analyzed; three patients <18 years of age and one patient who refused the use of his record were excluded from the study. Groups S and NS included 57 and 44 patients, respectively. Of the patient characteristics before the onset of DIC, data on heart disease, diabetes, hypertension, and the rate of smokers did not significantly differ between the groups (Table 1). However, the group NS had fewer women (47% vs 22%, p = 0.011) and a higher average BMI (20 ± 4 vs 23 ± 4, p < 0.001) than the group S. The age in group NS was higher than that in group S (68 ± 17 vs 75 ± 11, p = 0.036). BMI body mass index, DIC disseminated intravascular coagulation. The duration from the onset of disease causing DIC to rTM administration in group S and NS is shown in Table 2 (0 days, 40% vs 20%; 1 day, 33% vs 30%; more than 2 days, 26% vs 50%). More than 70% of the patients in group S were administrated rTM within 1 day from the onset of disease causing DIC. Administration of rTM in group S was significantly earlier from the onset of disease causing DIC (p = 0.030). The relationship of time duration between the onset of disease and rTM administration (as X factor) with survival rate (as Y factor) is shown in Figure 2.
rTM recombinant thrombomodulin, U unit, Duration from onset to rTM duration from the onset of disease causing DIC to rTM administration, APACHEII Acute Physiology and Chronic Health Evaluation II, SOFA Sequential Organ Failure Assessment scores, at start of rTM at the start of rTM administration, at end of rTM at the end of rTM administration, DIC score score of DIC criteria of the Japanese Association for Acute Medicine, CRRT continuous renal replacement therapy. 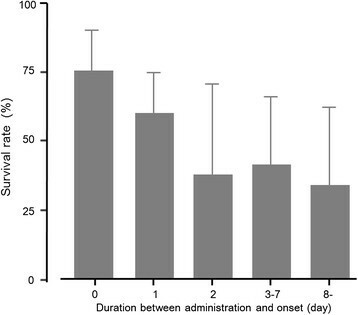 The relationship of time duration between the onset of disease and recombinant thrombomodulin administration with survival rate. The relationship of time duration between the onset of disease and recombinant thrombomodulin (rTM) administration (as X factor) with survival rate (as Y factor). Gray bar denotes mean survival rate, and gray line signifies mean 95% confidence interval. At the start of rTM administration, the APACHEII and SOFA scores were significantly lower in group S as shown in Table 2 (26 ± 6 vs 32 ± 6, p < 0. 001; 9.5 ± 4.2 vs 13.4 ± 3.6, p < 0.001). Although the DIC scores at the start of rTM administration were not significantly different in both groups, the DIC score at the end of rTM administration in group S was significantly lower than that in group NS. The use of continuous renal replacement therapy (CRRT) was significantly higher in group NS (58% vs 91%, p < 0.001). The rate of mechanical ventilation with intratracheal intubation in group NS was significantly higher than that in group S. The duration of mechanical ventilation with intratracheal intubation was significantly shorter in group S (11 ± 17 vs 23 ± 38 days, p = 0.038). Hemorrhagic complications occurred in two patients (2.0%). Of the two patients, one who received rTM combined with gabexate mesilate for 2 days developed bleeding of the ocular fundus. Another patient with cirrhosis (Child-Pugh classification B) developed a respiratory tract hemorrhage. Multivariate logistic regression analysis of outcomes was performed (Table 3). Hosmer-Lemeshow test (chi-square = 15.13, degrees of freedom = 8, p = 0.057). APACHEII Acute Physiology and Chronic Health Evaluation II, rTM recombinant thrombomodulin. rTM x day Duration from the onset of disease to rTM administration was x day, 2- days more than 2 days. The duration of time between the onset of disease causing DIC and rTM administration, the APACHEII score, the SOFA score, and CRRT use were selected as candidate variables (p < 0.05). The SOFA scores and CRRT use were highly correlated with the APACHEII score (Pearson correlation = 0.63 and 0.43, respectively). Therefore, the SOFA score and the use of CRRT were excluded from this model. Late administration of rTM (more than 2 days between the onset of disease and rTM administration) was associated with undesirable outcome (odds ratio = 3.36, 95% confidence interval = 1.03–10.92, p = 0.044). Patients who would benefit from rTM remained unclear. However, the results of this study indicated that the administration of rTM before an increase in the severity of disease causing DIC might be better than that after progression of disease causing DIC if we select rTM for the treatment of DIC. Therefore, we should consider administration of rTM as soon as possible after we diagnose severe diseases with DIC such as sepsis. As clearly shown in this study, the treatment of rTM might not be effective after diseases have progressed and the severity of the patients’ conditions, based on the APACHEII and SOFA scores, has increased. Late administration of rTM (more than 2 days from the onset of disease to rTM administration) was associated with a threefold higher risk of undesirable outcomes than early administration. These data suggested that administration of rTM before progression of disease causing DIC might be better than that after progression of disease. The correlation between rTM administration timing and the prognosis of patients with rTM has not been reported. On the other hand, previous reports indicated that APC administration in the advanced phase, for example, in patients with high APACHE II scores (more than 25), was effective, but early administration of APC was not effective ,. We did not compare between these studies about APC and our study because the APACHE II scores in our study were more than 25. In addition, cases in which early administration of rTM was possible, such as delay of diagnosis of DIC, might exist in our study because of a retrospective design. In other words, for example, we could not deny that the diagnosis of DIC might be delayed in general ward because the prothrombin time ratio and the concentration of fibrin/fibrinogen degradation products were not usually measured. In these cases, we might diagnose DIC after ICU admission, although DIC had already occurred before ICU admission. However, we thought that the results of the correlation between rTM administration timing and the prognosis of patients with rTM did not change. Therefore, further randomized clinical trials are required to elucidate whether early administration of rTM is actually effective. This drug exerts effect of anticoagulation via unique mechanism. The use of rTM promotes protein C activation by thrombin, resulting in the inhibition of thrombin generation, namely, a negative feedback loop . This mechanism might contribute to few hemorrhagic complications. Indeed, a previous study reported that hemorrhagic complications occurred in 8.6% of patients who received APC . On the other hand, hemorrhagic complications in our study were observed in two patients, but the frequency was as low as 2.0%. One patient who developed bleeding of the ocular fundus improved completely without any medication. Another patient with cirrhosis stopped having a respiratory tract hemorrhage after platelet transfusion because of low platelet count due to DIC and cirrhosis. These patients such as those having serious liver damage and those who use anticoagulation drug might require further attention. Further examination is necessary because this study included only two such patients. This study has several limitations because of its retrospective design. First, we could not determine the effect of rTM itself because this study did not include a control group in which rTM was not administered, since rTM is the first-line drug for the treatment of DIC in our hospital. At least, the mortality rate in this study was 44%, which is equivalent to or better than those reported in earlier studies . In addition, this study suggested that administration of rTM after progression of disease causing DIC might be less effective. Therefore, the independent effect of rTM compared with other treatments in the early phase of DIC needs to be elucidated in other studies. Second, the therapeutic method was decided by individual physicians. Therefore, the use of CRRT was significantly different. Although many patients in group NS received CRRT, whether death was due to the severity of the underlying disease or whether the results were biased is unclear. In addition, the APACHE II score in group NS was significantly higher than that in group S. However, we performed multivariate logistic regression analysis. At least, we believed that in our study, late administration of rTM tended to be associated with increased mortality. Third, group S had more number of female patients. Sepsis-related mortality rates are reported to be higher in female patients than in male patients . Although gender was highly associated with the outcomes in our multivariate logistic regression analysis, the late administration of rTM was also a risk factor for mortality. The c-statistics in this model was 0.820, which suggests that the results of this analysis are reliable. Finally, the age in group NS was higher than that in group S. However, age was included in the components of the APACHEII score. Therefore, age was correlated with the APACHEII score (Pearson correlation = 0.29). In this reason, age was excluded from this model. In conclusion, the results of this study suggest that administration of rTM before progression of disease causing DIC might be better for the treatment of DIC than that after progression of disease causing DIC because DIC scores at the start of rTM were not significantly different between groups S and NS. In other words, administration of rTM after progression of disease might be less effective. However, this study was a retrospective study and did not have a control group. Therefore, further randomized clinical trials are required to elucidate whether early administration of rTM is actually effective. TY and RN designed this study, collected data, and wrote the manuscript. NK and TI performed the statistical analyses. KY and MY helped design this study and prepared the manuscript. All authors read and approved the final manuscript.